Is frequent sauna bathing beneficial? That's what one study suggests. When the study started all 1621 men (aged 42 to 60) had normal blood pressure and none had been diagnosed with hypertension, and the follow-up was about 22 years later. 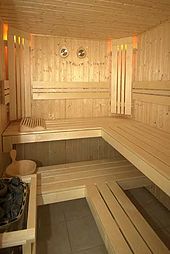 The study took place in Finland, where sauna bathing is an important part of the culture - for all men, from all walks of life. The study found that frequent sauna bathing lowered the risk of developing hypertension - 46% when comparing men who sauna bathed once a week vs those who sauna bathed 4 to 7 times a week. Frequent sauna bathing reduces the risk of elevated blood pressure, according to an extensive follow-up population-based study carried out at the University of Eastern Finland. The risk of developing elevated blood pressure was nearly 50% lower among men who had a sauna 4-7 times a week compared to men who had a sauna only once a week. The same researchers have previously shown that frequent sauna bathing reduces the risk of sudden cardiac death, and cardiovascular and all-cause mortality. Elevated blood pressure is documented to be one of the most important risk factors of cardiovascular diseases. The Kuopio Ischaemic Heart Disease Risk Factor Study (KIHD) involved 1,621 middle-aged men living in the eastern part of Finland. Study participants without elevated blood pressure of over 140/90 mmHg or with diagnosed hypertension at the study baseline were included in this long-term follow-up study. Based on their sauna bathing habits, men were divided into three sauna frequency groups: those taking a sauna once a week, 2-3 times a week, or 4-7 times a week. During an average follow-up of 22 years, 15.5% of the men developed clinically defined hypertension. The risk of hypertension was 24% decreased among men with a sauna frequency of 2-3 times a week, and 46% lowered among men who had a sauna 4-7 times a week. Sauna bathing may decrease systemic blood pressure through different biological mechanisms. During sauna bathing, the body temperature may rise up to 2 °C degrees, causing vessels vasodilation. Regular sauna bathing improves endothelial function, i.e. the function of the inside layer of blood vessels, which has beneficial effects on systemic blood pressure. Sweating, in turn, removes fluid from the body, which is a contributing factor to decreased blood pressure levels. Additionally, sauna bathing may also lower systemic blood pressure due to overall relaxation of the body and mind.